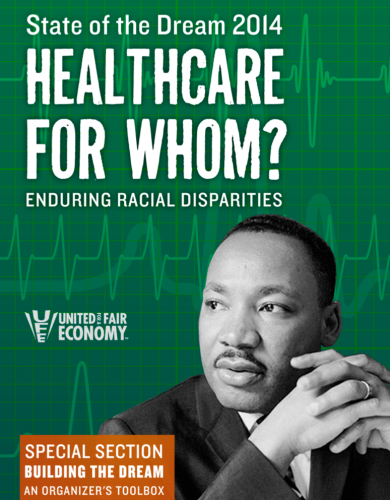 UFE's eleventh annual MLK Day report–Healthcare for Whom?–explores the racial economic implications of one of the most important human rights issues and public policy debates of the day: healthcare. The report looks at both disparate health outcomes–driven largely by racial segregation and concentrated poverty–and the current state-by-state fights over implementing the Affordable Care Act. The report also includes the latest data on racial disparities in education, employment, income, poverty and wealth that indicate the dream of racial equity, as so clearly articulated by Dr. King, remains unfinished. For the first time, this MLK Day report contains an "organizers toolbox" with a series of interactive workshops organizers can use at local worker centers, union halls, church groups, and community groups to examine the causes and consequences of the racial wealth divide and move people to action. To read past State of the Dream reports–A Long Way from Home, The Emerging Majority, Austerity for Whom?, Drained and others–click here. New Yorkers push for pre-k funding! Mayor DeBlasio and a growing number of upper-income New Yorkers recognize that universal pre-K is one of the best investments we can make in our future. Each $1 invested in pre-K results in $17 of future savings in public spending on special education, social programs and incarceration. By imposing a modest half percent tax on NYC income above $500,000, the City can guarantee a steady stream of pre-K funding and close the achievement gap between upper- and lower-income kids. All that potentially stands in the way is approval of the Mayor's plan by the New York State governor and legislature in Albany. Do you have New York City income of over $500,000? If so, we hope you will sign this letter to Gov. Cuomo and the legislature in support of Mayor DeBlasio's universal pre-K proposal. If you don't have that level of income, you can still sign below in support of the letter. We are upper-income New York City residents who support Mayor Bill de Blasio’s plan to raise a small tax on the wealthiest among us to fund an expansion of early childhood education and after-school programs. We believe this plan is a sound investment in the long-term economic success of our city. This tax is not only fair, but is necessary to create the level of dedicated funding required to make a real commitment to expanding high-quality Pre-K programs and reach more children. New York State first committed to the goal of universal pre-k in the late 1990s, but without adequate funding, there has not been enough progress on making programs truly universal, and pre-k funds have been subject to cutbacks in bad economic times. The return on investment in high-quality pre-kindergarten and after-school programs is unparalleled; a 2010 report from the United States Chamber of Commerce’s Institute for a Competitive Workforce found a savings of up to $17 for every $1 invested in pre-k. Ensuring that children are prepared to start school and succeed once they get there not only improves their chances of attending college and earning higher wages, but reduces the need for future spending on special education, incarceration, and public benefits. This benefits us all. Investing in pre-k and after-school programs is a benefit to all residents of New York City, and more than makes up for the costs. With a modest half-percent tax on those making more than $500,000 per year, we can make huge strides toward leveling the playing field for children by closing the achievement gap between low-income students and their higher-income peers. We firmly believe Mayor de Blasio’s plan is the best way to ensure economic prosperity for our city, both now and in the future. We are willing to do our part, and hope you will do yours. We respectfully urge you to support this fiscally sound plan, to ensure that the investment we make in our children has a solid and long-term foundation. It's an exciting time here at United for a Fair Economy, excitement we are now proud to share with our many supporters across the nation: on December 13, United for a Fair Economy adopted a new, five-year strategic plan! This plan is the product of 12 months and countless hours of thoughtful deliberations, listening to our allies and supporters, three retreats and one epic blizzard. At the outset, one of the things we learned as we interviewed key stakeholders was that UFE has accomplished its original mission: raising awareness about the dangers of concentrated wealth and power. Yes, inequality is now part of the mainstream dialogue. Needless to say, many others in the fight for economic justice helped, but you and United for a Fair Economy had a direct role in getting the word out there that economic inequality is rising—dramatically—and hurting all of us. Indeed, the President of the United States refers to economic inequality as "the defining challenge of our time." So what, then, is our role now? It's a bit of a rhetorical question because UFE has long done much more than raise awareness. For over a decade, thanks to the generous support and partnership of thousands of supporters—like you!—UFE has engaged directly in major policy debates, provided trainings for organizers across the nation, published illuminating reports highlighting the true consequences of economic inequality, and much more. But it is a good question to ask as we chart the most effective pathway forward. United for a Fair Economy challenges the concentration of wealth and power that corrupts democracy, deepens the racial divide and tears communities apart. We use popular economics education, trainings, and creative communications to support social movements working for a resilient, sustainable and equitable economy. Awareness is still an important part of the work, but the emphasis is now on actively supporting social movements for greater equality. We’ve asked some hard questions over the past year. Where can UFE have the greatest impact in the fight against extreme inequality? Who is it that we should be working with? How can we support them and be strong partners in their struggles? Asking these questions and reflecting upon them helped us decide who we’ll be working with next. Our choice, simply put, is individuals, groups, and populations on the front lines of the fight for greater equality: low-wage worker networks and state-based tax fairness organizing. Why low-wage workers? Because whether organizing for a higher minimum wage and paid sick leave, striking in front of fast food restaurants, or flash-mobbing in a WalMart, low-wage workers are the cutting edge in the fight for economic change. And—perhaps most importantly—because low-wage workers and those living in states under assault from the Right deserve a better deal in this country. Why state-based tax fairness? Because the terms of the national debates are being shaped in the states first. We'll provide trainings, resources, networking opportunities and more to our 22 partner organizations working on the ground to push back against the bad stuff, but also to push forward bold policies that can inspire others around the nation. And there's a clear role for members of UFE's Responsible Wealth network: supporting the fights of our low-wage worker and tax fairness networks, speaking out in support of living wage fights, against senseless tax cuts for the wealthy, and more. There’s a lot more inside our new strategic plan. For example, specifics about how we will engage and support these constituencies. And in 2014, we’ll be sharing the entirety of the plan, so consider this a sneak peek. For now, I’d like to offer an invitation for you to join with us at United for a Fair Economy as we see where this road map takes us in 2014 and beyond–challenging the concentrated wealth and power that corrupt our democracy, deepen the racial divide, and tear communities apart. Not only can we make a better world. We must. Thank you for your interest in working for UFE. Please note that the deadlines for these three positions have now passed. We are excited to announce that we are hiring for three positions at United for a Fair Economy! See below for a short description of each position and follow the links to read more. Ezra Klein of the Washington Post calls it "perhaps the single best economic speech of his presidency." The folks on Fox News were whining about "redistribution." Picking up a cab in Baltimore the next morning, the first thing the driver asked me was whether I saw the President's speech… He loved it. However one ranks it, Pres. Obama's speech on Wednesday nailed it, calling economic inequality the "defining challenge of our time." He clearly articulated the history, much as we do at United for a Fair Economy, of how we built the middle class in America. Spoiler: It was not a product of unfettered markets and heroic bootstrapping. It was built through deliberate public investments, a broad tax system based on ability-to-pay, and rules-changes that created ladders of opportunity and which helped ensure that workers shared in the prosperity their labor made possible. "Now, the premise that we’re all created equal is the opening line in the American story. And while we don’t promise equal outcomes, we have strived to deliver equal opportunity -- the idea that success doesn’t depend on being born into wealth or privilege, it depends on effort and merit. And with every chapter we’ve added to that story, we’ve worked hard to put those words into practice." "Together, we forged a New Deal, declared a War on Poverty in a great society. We built a ladder of opportunity to climb, and stretched out a safety net beneath so that if we fell, it wouldn’t be too far, and we could bounce back. And as a result, America built the largest middle class the world has ever known. And for the three decades after World War II, it was the engine of our prosperity." The President acknowledged that not all Americans benefitted. Racism and Jim Crow kept many down. "The economy didn’t always work for everyone. Racial discrimination locked millions out of poverty -- or out of opportunity. Women were too often confined to a handful of often poorly paid professions. And it was only through painstaking struggle that more women, and minorities, and Americans with disabilities began to win the right to more fairly and fully participate in the economy." The President did not talk about this in his speech, but as we have argued in our "State of the Dream" reports and The Color of Wealth, there is a connection between the civil rights victories, the War on Poverty, and the subsequent racialization of the very public investments that previously built the middle class. That is, once Blacks and others began to benefit from these public investments, conservatives were able to play upon White fears and demonize government. Public supports that once built the White middle class became "hand outs," and Reagan, during his 1976 presidential bid, introduced the world to the term "welfare queen." "As values of community broke down, and competitive pressure increased, businesses lobbied Washington to weaken unions and the value of the minimum wage. As a trickle-down ideology became more prominent, taxes were slashed for the wealthiest, while investments in things that make us all richer, like schools and infrastructure, were allowed to wither. And for a certain period of time, we could ignore this weakening economic foundation, in part because more families were relying on two earners as women entered the workforce. We took on more debt financed by a juiced-up housing market. But when the music stopped, and the crisis hit, millions of families were stripped of whatever cushion they had left. Then the President shifted from inequality to the erosion of social mobility, bringing us to where we are today as increasing inequality collides with decreasing social mobility. "The idea that so many children are born into poverty in the wealthiest nation on Earth is heartbreaking enough. But the idea that a child may never be able to escape that poverty because she lacks a decent education or health care, or a community that views her future as their own, that should offend all of us and it should compel us to action. We are a better country than this. So let me repeat: The combined trends of increased inequality and decreasing mobility pose a fundamental threat to the American Dream, our way of life, and what we stand for around the globe." 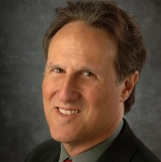 In UFE's 2012 book, The Self-Made Myth, we quote former Genzyme CFO Jim Sherblom who, after speaking of the many ways public investments and an active government helped he and his wife succeed financially, acknowledged the dramatic shifts occurring since that will now shape the lives of his own children, "We are going to be a very different society with very different expectations about what is possible for a young, ambitious person who wants to do well in life..."
The President, in his speech goes on to talk about not just the moral injustice of it all, but the damaging consequences this inequality has on our economy, trust in each other and in our institutions, and our democracy, adding that, "The decades-long shifts in the economy have hurt all groups: poor and middle class; inner city and rural folks; men and women; and Americans of all races." He threw his support behind the fast-food workers striking across the country for an increased minimum wage. He spoke about closing tax loopholes, education, Social Security, food stamps, and more. Speaking about the implementation of the Affordable Care Act, he also spoke of the necessity of closing the health coverage gap, quoting Dr. King, "Of all the forms of inequality, injustice in health care is the most shocking and inhumane.” This is a theme we'll be talking about in our upcoming State of the Dream report. The full speech is worth a read, but one of the core take-aways is that history matters… as much or more than data points. One can quote unemployment statistics, but outside the context of history and that deeper understanding, people will just fill in the blanks with their own preconceived notions of why one group is more likely to be unemployed than another, or why wealth is piling up in the hands of the few. Narrative and a deep understanding of how we got here is critical to understanding how we move forward. Or, as others would say, you can't know where you're going unless you know where you've been. Now, onward to the next fight. There is little question that Republicans took a political hit for the senseless government shutdown. If there is a lesson to be learned for the GOP (and everyone else), it’s that government shutdowns and debt-ceiling standoffs are counterproductive and irresponsible bargaining chips in political debate (not to mention a cruel tactic for millions of Americans, not just federal employees and beneficiaries of public assistance programs, but everyone really). But whatever is learned, the larger fight over taxes and public investments is far from over. In addition to UFE's fights to strengthen the federal estate tax and tax wealth like work, UFE is one of 150 organizations supporting the "Robin Hood Tax," an exciting proposition that could raise hundreds of billions of dollars to invest in our communities (and raised from the reckless Wall Street speculators who wrecked the economy in the first place). The Inclusive Prosperity Act (H.R. 1579) by Rep. Keith Ellison would create such a "Robin Hood Tax," or financial transactions tax (FTT), on the sale of stocks, bonds, derivatives, and other financial instruments. The FTT rate on stocks would be 0.5%, with lower rates applied to bonds and derivatives. Because the financial transactions tax is levied each time a stock is sold, its otherwise nominal rate is magnified many times over for those speculators who buy and sell stocks repeatedly in a single week or day. If someone buys $100 in stock shares and holds it for 5 years, the tax expense, 50 cents, will be spread over 5 years (so you will owe effectively 10 cents a year in taxes on this transaction). But if you trade that same stock each week to gain some small advantage, you'll pay $26 a year instead. And if you trade hourly using automated computer software, well then the multiplier effect really kicks in. That's the whole point! By taxing at the point of transaction, the Robin Hood Tax effectively separates the type of long-term investments that are good for the economy, from the type of high-frequency trading – or "casino capitalism" – that contributes nothing but volatility and instability to the economy. If people want to gamble, they should go to Vegas. We cannot afford to let the reckless behavior of Wall Street gamblers take down the global economy again. Levied at the rates of the Inclusive Prosperity Act, the financial transactions tax would raise upwards of $350 billion. That is a tremendous amount of money that will be moved out of disruptive speculation and into the public sector, where it is truly needed. Just for a sense of scale, $350 billion is more than the combined total of President Obama's proposed 2014 discretionary budgets for the Departments of Education, Housing and Urban Development, Veterans Affairs, and Transportation! Applying this level of funding to the real needs of the nation – health care and health research, rebuilding and greening our transportation infrastructure, education, job creation, and more – would have a profound and positive impact on our nation's long-term well-being. Already 40 nations across the world have some form of financial transactions tax, including the United Kingdom, Japan, China, and many others. At this point, the majority of the major financial centers around the globe are operating in nations with a financial transactions tax. Additionally, the 0.5% rate on stocks being proposed in the Inclusive Prosperity Act is the same rate the United Kingdom already levies, and that has in no way endangered London’s status as powerhouse in global finance. The US actually had a financial transactions tax from 1914 to 1966, levied initially at 0.2% and later raised to 0.4%. After the stock market crash in 1987, there was a serious effort, led in part by one of President George H.W. Bush's chief economists, to restore the financial transactions tax in order to bring stability to the markets. With 11 nations across Europe now looking seriously at enacting a financial transactions tax, this has become a growing global movement to rein in the kind of casino capitalism that wreaked havoc on the global economy, while funding vital programs that foster true national wellbeing. Visit the Robin Hood Tax web page to for news, research, talking points, and other helpful resources! Contact your member of Congress and ask them to support H.R.1579, the Inclusive Prosperity Act. The government shutdown is part of much broader assault on the Affordable Care Act, also known as Obamacare. Despite some of the rhetoric, low-income and struggling Americans are not just "caught in the crossfire." On the contrary, they are the intentional targets of a senseless political attack. This shutdown has nothing to do with government spending, and the budget. As Citizens for Tax Justice (CTJ) makes very clear, "Democrats have already agreed to the level of spending proposed by the Republicans, at least in the short-term." The continuing resolution that the Senate passed in September, if continued through the rest of the year, would allocate $986 billion in discretionary spending, far below the $1,203 billion that President Obama called for in his first budget proposal. It's essentially on par with the draconian Ryan Plan that called for only $967 billion in discretionary spending. The shutdown is not about the fiscal year 2014 budget, cutting spending, or reducing the national debt. It is about undermining the Affordable Care Act and denying health coverage to millions. It is part of a multi-prong attack on the President's signature health care plan, and it reflects a total disregard for the well being of families everywhere. "Because they live in states largely controlled by Republicans that have declined to participate in a vast expansion of Medicaid, the medical insurance program for the poor, they are among the eight million Americans who are impoverished, uninsured and ineligible for help." "The law was written to require all Americans to have health coverage. For lower and middle-income earners, there are subsidies on the new health exchanges to help them afford insurance. An expanded Medicaid program was intended to cover the poorest. In all, about 30 million uninsured Americans were to have become eligible for financial help." By refusing to participate in the Medicaid expansion, the mostly Republican-controlled states are effectively punching a hole right in the middle of the Affordable Care Act – a hole through which eight million struggling Americans will now fall. "The 26 states that have rejected the Medicaid expansion are home to about half of the country’s population, but about 68 percent of poor, uninsured blacks and single mothers. About 60 percent of the country’s uninsured working poor are in those states. Among those excluded are about 435,000 cashiers, 341,000 cooks and 253,000 nurses’ aides." Black Americans are much more likely to be uninsured than whites going forward because so many of the states that have refused to participate in the Medicaid expansion are Southern states in the heart of the Black Belt – states where a history of racism has prevented many blacks from achieving middle-class security. But, denying health care coverage to eight million people living in these 26 states isn't enough. Now Tea Party Republicans are demanding a delay in implementation of the Affordable Care Act in all 50 states in exchange for ending the government shutdown. Again, those who go without health care as a result of this assault on the Affordable Care Act are not simply "caught in the crossfire" — they are it's intended targets. Meanwhile, there are those who actually are "caught in the crossfire" of this shutdown, including: 800,000 federal workers (who are also disproportionately black) and many more government contractors; low-income families who rely on Women, Infants and Children's (WIC) nutrition programs or Head Start (as of Wednesday, an estimated 50 Head Start sites have closed, affecting 3,200 preschool-aged children from low-income families); vacationing families stranded outside of national parks that are now closed; and many others. If your US Representative is one of the Republican hold-outs, tell them to send a "clean continuing resolution," with no delays in the Affordable Care Act, to the House floor for a vote. If your US Representative is one of the Democrats, tell them to stay strong and refuse to cave into the Tea Party extremists who want to undermine the Affordable Care Act. It's worth exploring the ways capitalism affects our lives so we can make more informed decisions for improving our economy. That's the goal of a traveling interactive art installation that UFE is supporting in New York City. Join us on October 6-9 in Times Square! If you want to join the street team, email Maz Ali at mali@faireconomy.org. UFE's Steve Schnapp (L) facilitates street dialogue on the economy while participants wait to vote at Steve Lambert's "Capitalism: Works for Me! (True/False)." 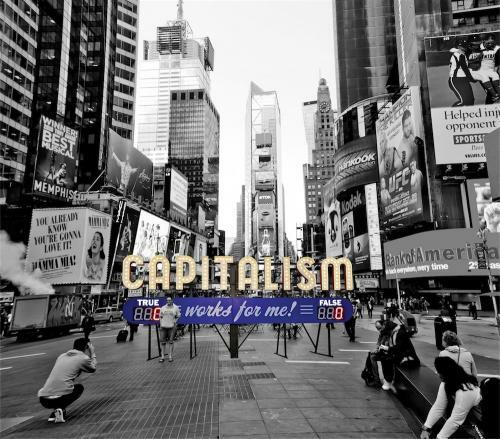 Steve Lambert — artist, culture jammer, educator, and co-founder of the Center for Artistic Activism — presents passers-by with the statement, "Capitalism: Works for Me!" and asks participants to vote true or false. But, rather than have people cast hair-trigger votes based on ingrained notions, Steve urges some critical thinking and dialogue to get at the ways capitalism helps or hinders our individual circumstances. That's where UFE and our allies come in. 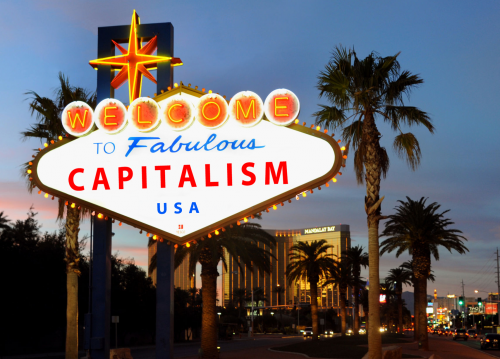 Capitalism, like it or not, is the main system on which the U.S. economy operates...for now, anyway. It is a market-based system that, in ideal circumstances, provides a competitive arena for private businesses to sling goods and services. The upsides are visible – they're in the hypnosis of your computers, tablets, and smartphones; in the comfort and convenience of your car; in the connections you make and cheap crap you buy online; and it's even in fond memories of family trips to capitalism-inspired sites like Times Square. The downsides are also plain to see, but they're not often attributed to the system of capitalism itself – they're in the blocks of foreclosed homes, lost 401Ks, Mc"Food" deserts, unfathomable healthcare costs, climbing productivity but stagnant wages, out-of-reach higher education, and other unsavory realities. "It takes money to make money," right? Our political economic system provides significant advantage to those who have capital to begin with. The Reagan era marked the start of a trend toward freer, less regulated markets – a movement for the heightened influence of capitalism in the global economy. Since then, our country has fallen victim to historic levels of income and wealth inequality and is becoming a land of haves and have-nots. The question of which category you fall into is complex and riddled with contradictions. But, with the majority of Americans agreeing that inequality has gotten out of hand, we have to more openly examine those complexities and bring the debate more into the public eye. If you're in or around New York City on October 6-9 between the hours of noon and 7:00 p.m., please join us as a participant or volunteer. Here are select interviews from the opening day of the installation. Two weeks ago, Forbes released its 2013 list of the richest 400 Americans. And the not-so-surprising news: The fortunes of those at the top continue to rise while Americans across the country continue to suffer. What is surprising though is that they have now regained "all" of the losses from the economic collapse. "Five years after the financial crisis sent the fortunes of many in the U.S. and around the world tumbling, the wealthiest as a group have finally gained back all that they lost. The 400 wealthiest Americans are worth just over $2 trillion, roughly equivalent to the GDP of Russia. That is a gain of $300 billion from a year ago, and more than double a decade ago. The average net worth of list members is a staggering $5 billion, $800 million more than a year ago and also a record. The minimum net worth needed to make the 400 list was $1.3 billion. The last time it was that high was in 2007 and 2008, before property and stock market values began sliding. Because the bar is so high, 61 American billionaires didn’t make the cut." Half of those who dropped off the Forbes list didn't do so because their fortunes' declined. They "fell off the list" because others passed them up. As Forbes notes, "The rest simply couldn't keep up with the rising tide." It's an economic bonanza for the rich. At least 40% of those on the 2011 Forbes 400 list inherited a medium-sized business or substantial wealth from a spouse or family member. Over 20% – including many Walton family members – inherited enough to place them on the Forbes 400 list with their inheritance alone. It's like they were born on home plate. Only a small number can be said to truly come from modest means, and even they had help. America's long history of race and gender bias also shape who is and is not on the list. Women and people of color make up only a tiny sliver of the overwhelmingly white, male Forbes 400. Even in 2013, the Forbes list includes only one African-America: Oprah Winfrey. In UFE's 2006 book, The Color of Wealth, we examine the history of these disparities, including the way that women and people of color have been systematically excluded from the wealth-building public programs that helped create the white middle class. These wealth disparities have been passed on to each successive generation through the power of inheritance. It's not just the birthright, there are public policies that give an unnecessary "leg up" to those at the top. One of the more egregious tax breaks we give to the wealthiest Americans is the reduced tax rate on investment income. We tax investment income from capital gains and appreciated stock at nearly half the top rate at which we tax income from wages earned through actual work. Who does that special tax break benefit? No great mystery here. 60% of the income made by the Forbes 400 billionaires comes from capital gains, i.e. investment income. Together with the rest of their compatriots in the top 0.1%, they capture half of all capital gains income in the country. At the very least, we need to "tax wealth like work" and end this special tax break that disproportionately benefits those at the top. By ignoring the role of inherited wealth, race, gender, and public policy advantages, Forbes describes many of the richest Americans as "self-made." 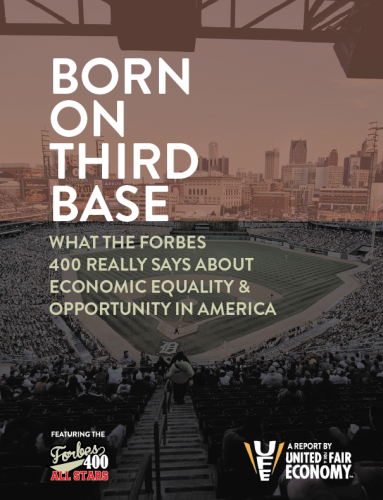 This is an assertion that UFE challenged, both in our "Born on Third Base" report and in our 2012 book, The Self-Made Myth. Attributing the success of those at the top entirely to their own efforts, by implication, also insinuates that those who are poor, are poor by their own efforts. Such an incomplete, black-and-white narrative distorts our views on the merits of a host of public policies—through this lens, progressive taxes become akin to "punishing success," and public policies aimed at correcting past injustices become "hand outs." The list goes on. Instead of falling over ourselves in gleeful adulation of the superrich, let's honor the labors of all hard-working people across the country, and not overlook all the nuances. At the very least, it will be a more honest dialogue. At the most basic level, taxes exist to fund the government. Decisions about how much revenue we should raise from federal taxes and from what sources we should raise it are incredibly important. The influence of federal tax policy ripples throughout the entire economy and affects funding at all levels of government. United for a Fair Economy believes a sustainable and people-oriented tax system should be based on three key principles. And, we support several common-sense policies that are designed according to those principles. Generate the appropriate amount of revenue to fund our national priorities. The current tax code does not raise enough revenue, which leads to cuts to programs and services. Raise revenue from the sources that can most afford to pay for our collective enterprise of government. New revenue should come from the wealthy and from corporations whose taxes are lower now than they were a generation ago. Make it easier to file and collect our taxes. Making it easier to file taxes will make the system fairer and make tax avoidance more difficult. It will also reduce the burden of compliance on families and small businesses. These principles should guide all federal tax reform and policy change decisions. The main purpose of taxation is to generate revenue. We should generate enough revenue to pay for our national priorities and avoid unnecessary budget cuts. We should raise tax revenue from the sources that can most afford to pay. And we should make paying and collecting taxes simpler. UFE and Responsible Wealth have held many press events featuring remarkable guest speakers from varying walks of life and work. 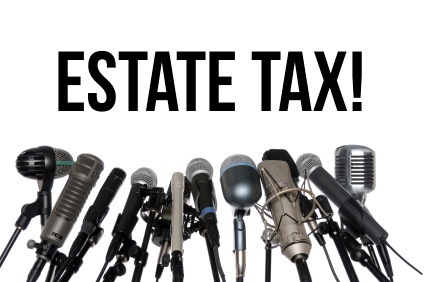 Many of those speakers are wealthy individuals who have been, or will be, affected by the estate tax. But, they all have at least one thing in common – passionate support for the estate tax, because of what it represents: the common good and opportunity for all Americans. "Consider a wealthy family with two children. Under the  law, each child could inherit $3.5 million, tax free. That means each child would receive more, tax free, than the average worker would earn in two lifetimes. And the worker would be paying taxes on their earnings. Each of these children would receive more, tax-free, than 240 minimum wage workers would receive in a year." 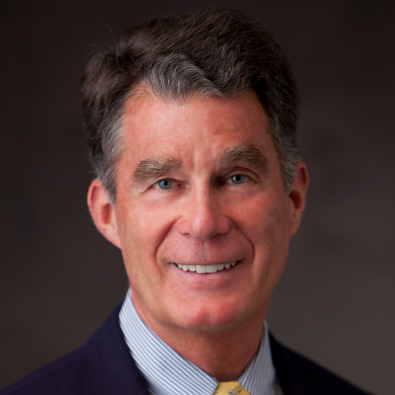 "[P]assing a stronger estate tax is a matter of ethics, of responsibility, of pride in citizenship, and it's the right fiscal choice for our country...I don't ever forget, as do some of my colleagues, that I benefited from a lot of business incentives and tax laws as I was building Vanguard Group to what it is today, and I owe some of that back." "People who accumulate substantial wealth have not done so alone. They have benefited from the labor of employees and have built their businesses using public infrastructure such as clean water, ports, roads, utilities, and the internet. In view of these considerations, an estate tax is a responsibility which should be inescapable, and which people should be proud to pay." "Wind River wouldn’t have existed without government-funded research that I did at Lawrence Berkeley Laboratories. I wouldn’t have gotten that job at the lab if I hadn’t had a master’s degree. I wouldn’t have had a master’s or a bachelor’s degree if there weren’t a public university that provided me with financial aid. And if I hadn’t gone to a good high school, also public, I probably wouldn’t have gotten into the university...Indeed, it will give me great pride to repay [society], hopefully many-fold, through the estate tax." "No one accumulates a fortune without the help of our society's investments. How much wealth would exist without America's unique property rights protections, public infrastructure, and academic institutions? We should celebrate the estate tax as an 'economic opportunity recycling' program, where previous generations made investments for us and now it's our turn to pass on the gift. 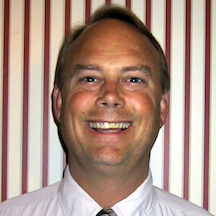 Strengthening the estate tax is important to our democracy." 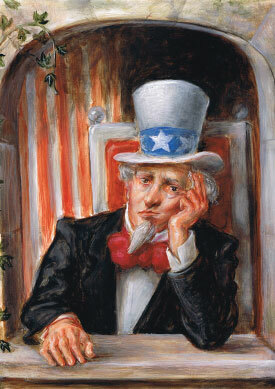 "At Frostyaire, our decisions about hiring employees, purchasing equipment, and expanding the business are not based on tax policy...The best way to help small businesses like ours is to put more money in the hands of the middle class who will spend the money as customers of our businesses, rather than cutting the estate tax to ensure that very wealthy heirs can have a larger inheritance." 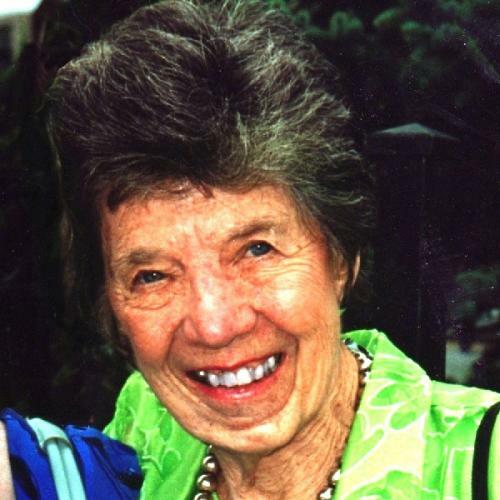 "The Rockefeller fortune could never have been created without the foundation of public laws, public education and infrastructure which undergirded American industry in my great-grandfather’s time and continues to do so today. Therefore, far from resenting our tax system, which allows this infrastructure to remain strong, I believe that a strong estate tax makes perfect sense." "I’ve been reasonably successful...I own and manage six office buildings and have some 50 people working for me, directly or indirectly. Would I say that I did it without public support? No. When I reflect on what helped my business succeed and grow, I owe quite a bit to public investments, including tax policies that help make the real estate industry lucrative." "Our economy remains on the edge of a double-dip recession, and we urgently need to create millions of jobs and invest in our future, not give more tax breaks to the wealthy. Anyone who pretends to care about cutting deficits while opposing the restoration of the estate tax is clearly residing on a different planet." We thank all of our guest speakers for their commitment to tax fairness. We are releasing this infographic just days after Duke University released a new study, which found that Black and Latino homebuyers are paying more for housing than Whites. Earlier this year, shortly after the release of UFE's report on housing and racial inequality, a Brandeis University study highlighted homeownership as the number one driver of the growing racial wealth gap. How many studies need to be published before policymakers begin treating housing like a human right and not a commodity to be gambled with on Wall Street? Perhaps more importantly, what must be done to unite and galvanize communities—of all races and classes—to push lawmakers and to take control of the situation where they're falling short? Inequality has become worse than most people think. Economic apartheid has gripped our country. But, money is no match for people power. Learn more about what's happening on the ground with State of the Dream 2013: A Long Way From Home. Share this information and invite others to join the conversation and take part in efforts to address racial injustice in your community. Download this infographic in English or Spanish.